Every single prepper in America is now looking like relatives to Albert Einstein. With the outbreak of Ebola here in America, and with the very real possibility that this deadly virus has spread to schoolchildren and paramedics, and medical staff, Americans are now in a hurry to purchase things like body suits, latex gloves, isolation gowns, and N95 masks. In a single day, the sales of body suits on a popular website rose more than 140,000 percent. No, that is not a typo. Although most of the supplies that would be used for families or personal use have been sold out already, there are a few others still in stock but are flying off the shelves. For example, a popular brand of black elderberry extract that is sold on that popular online website is down to only two left in stock as of this writing. Elderberry extract has long been known to have antiviral properties, but remains untested against Ebola. Besides basic medical and protection supplies, the next area of concern should be food. Keep in mind that the medical quarantines in Liberia were quickly followed by devastating food shortages. 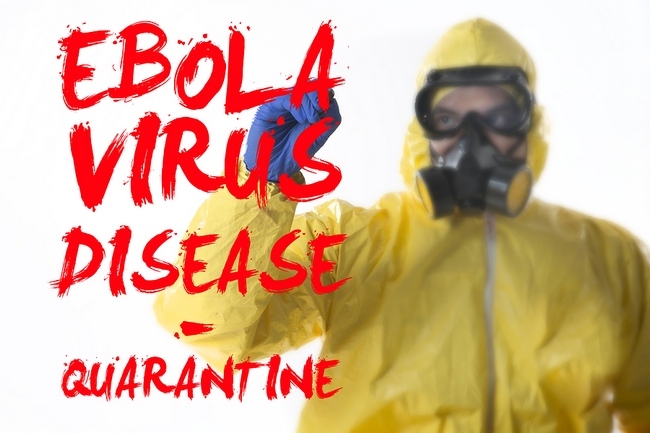 If you are caught in a medical quarantine area, there will be no commercial delivery trucks. This is why the moment people hear that quarantine might be issued, supermarket shelves will be emptied in a matter of hours. You should also know that medical quarantines are announced without any notice. This is because any type of advanced notice would allow people who might be infected to leave the area. It’s unknown exactly how many infections there would need to be to set off a quarantine notice, but your best advice would be that you should be prepared. At this writing the family of the Dallas Ebola patient has been placed under a medical quarantine and is currently under armed guard. They are also being forced to give blood to Texas health authorities on demand. It’s fairly clear that, in the case of a pandemic, all your normal rights of individual freedoms will be suspended and anyone who is even suspected for contracting this virus can be ordered into a forced 21 day isolation and medical intervention. We have been warned repeatedly that this day would come, but for most Americans, the latest episode of the Walking Dead and football games seem to take precedence. Should this outbreak manage to escape controls and turn into a full-fledged pandemic, then millions of people will find themselves caught in forced medical quarantines, at gunpoint if need be. Then, all those who previously laughed at preppers, those who whined about “fear mongering”, will all be shamefaced and will feel like fools. Read more how to prepare and protect yourself against Ebola.